Obituary for Kenneth C Cramm | Hunter Funeral Home, Inc.
Kenneth C. Cramm, 92, of Ursa passed away on Wednesday, March 21, 2018 in the North Adams Home in Mendon. Kenneth was born on July, 30, 1925 in Quincy to the late Carl and Marie (Kleemeyer) Cramm. He married Patricia A. Hillman on August 30, 1950 in Quincy. Patricia passed away on December 3, 2016. 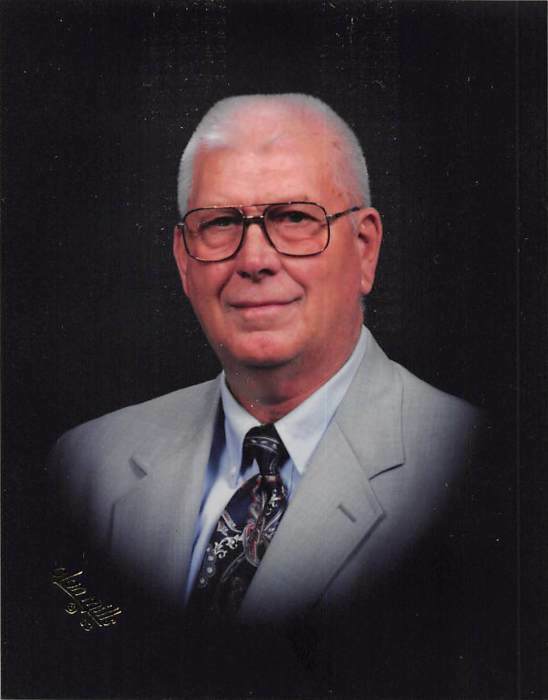 Kenneth was a retired farmer from the Ursa area and was a very active lifetime member of St. James Lutheran Church in Quincy, where he enjoyed doing various projects at the church. He was a Charter Member of the Ursa Lions Club and had 60 years of perfect attendance. In his younger years, Kenneth enjoyed bowling. After his retirement he enjoyed wood working and was an avid St. Louis Cardinals and Blue Devil Basketball fan. Surviving are; three children, Bruce (Mary) Cramm of Decatur, Cindy (Chuck) Miller of Quincy, Donna (John) Ezzell of East Peoria; nine grandchildren, Dereck Cramm, Jeremy Cramm, Stacy Cramm, Kelly Cramm, Jenny Fryrear, Jeff Callahan, Christy Wellman, Mark Ezzell, Julie Ezzell; two step grandchildren, Holly Elsie, Tom Miller; fifteen great-grandchildren and one sister, Mary Poblanz of Raleigh, N.C. He was preceded in death by his parents, his wife and one brother, Russell Cramm. Services will be 11:00 A.M. on Saturday, March 24, 2018 in St. James Lutheran Church in Quincy with Reverend Michael Fieberkorn officiating. Interment will be in Greenmount Cemetery in Quincy. Visitation will be from 9:30 until 11:00 A.M. at St. James Lutheran Church on Saturday, March 24, 2018. Memorial contributions have been suggested to the St. James Lutheran Church Radio Broadcast or the North Adams Home. You are invited to share memories of Kenneth and leave condolences at www.hunterfuneralhomes.com.